All transactions are safe and secure with a reliable history in online purchasing behind each of our associates. Buy the Gleek t-shirt to own Glee clothing and merchandise. Gleek t-shirts are all the rage because not only is it the name of the New Directions group members, it is also used to describe the show's diehard fans. 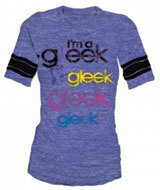 This Gleek shirt encompasses a wide variety of colors sure to satisfy anyone's Glee tee needs. Let your friends know that you like your television shows filled with rythm and music. Make sure you also check out our other merchandise like the Cheerio t-shirt in the gallery, as well as the Glee soundtracks to sing along with. In addition to the Gleek tee above, browse the Glee Clothing Gallery for more apparel like men's and women's clothes, kids shirts or hoodies.